One of the things I love about products I use in my household is hearing and learning the good the company does for communities, especially when it comes to kids. 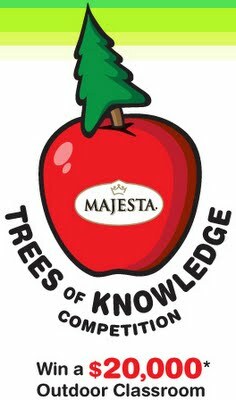 Education for kids means a lot to me and learning that Majesta has started their annual Tree of Knowledge Competition where your school could win $20,000 for an outdoor classroom, I was very impressed and excited all at once. Since 2011, Majesta, Tree Canada and Focus on Forests have been helping schools take learning outdoors, and this year even more schools will have the opportunity to bring their projects to life with additional prizes available for schools that finish 2nd, 3rd and 4th place and for the school that shows the most creativity in rallying support. Since the program was launched in 2011, more than 80 schools from across the country have submitted an application for their chance to win an outdoor classroom. Ideas for outdoor classrooms have included everything from gardens and nature trails, to shaded study areas, interactive learning spaces and musical play places. The most creative prize consisting of $3,000 for the school who shows the most creativity, enthusiasm and community engagement during the voting period. To apply, Canadian schools can visit majestatreesofknowledge.ca and enter before January 13, 2013.
time to be happy. I've read this put up and if I may just I want to suggest you few attention-grabbing things or suggestions. Perhaps you could write next articles referring to this article. I wish to read more issues approximately it! Not that I'm complaining, but sluggish loading instances times will very frequently affect your placement in google and could damage your high-quality score if advertising and marketing with Adwords. Anyway I am adding this RSS to my e-mail and could look out for much more of your respective interesting content. Make sure you update this again soon.